Resveratrol is currently a topic of numerous animal and human studies into its effects. The effects of resvaretrol on the lifespan of many model organisms remain controversial, with uncertain effects in fruit flies, nematode worms, and short-lived fish. It exists as two geometric isomers: ''cis-'' (''Z'') and ''trans-'' (''E''), with the ''trans''-isomer shown in the top image. The ''trans-'' form can undergo isomerisation to the ''cis-'' form when exposed to ultraviolet irradiation. ''Trans''-resveratrol in the powder form was found to be stable under "accelerated stability" conditions of 75% humidity and 40 degrees C in the presence of air. Resveratrol content also stayed stable in the skins of grapes and pomace taken after fermentation and stored for a long period. 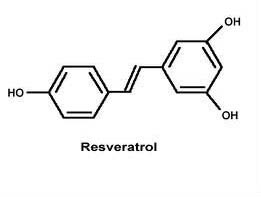 Resveratrol does not increase the life span of mice. In mouse and rat experiments, anti-cancer, anti-inflammatory, blood-sugar-lowering and other beneficial cardiovascular effects of resveratrol have been reported. Most of these results have yet to be replicated in humans. In the only positive human trial, extremely high doses (3–5 g) of resveratrol in a proprietary formulation have been necessary to significantly lower blood sugar. and is sold as a nutritional supplement derived primarily from Japanese knotweed. The groups of Howitz and Sinclair reported in 2003 in the journal ''Nature'' that resveratrol significantly extends the lifespan of the yeast ''Saccharomyces cerevisiae''. Later studies conducted by Sinclair showed that resveratrol also prolongs the lifespan of the worm ''Caenorhabditis elegans'' and the fruit fly ''Drosophila melanogaster''. In 2007, a different group of researchers was able to reproduce Sinclair's results with ''Caenorhabditis elegans'', but a third group could not achieve consistent increases in lifespan of ''D. melanogaster'' or ''C. elegans''. In 2006, Italian scientists obtained the first positive result of resveratrol supplementation in a vertebrate. Using a short-lived fish, ''Nothobranchius furzeri'', with a median life span of nine weeks, they found that a maximal dose of resveratrol increased the median lifespan by 56%. Compared with the control fish at nine weeks, that is by the end of the latter's life, the fish supplemented with resveratrol showed significantly higher general swimming activity and better learning to avoid an unpleasant stimulus. The authors noted a slight increase of mortality in young fish caused by resveratrol and hypothesized that it is its weak toxic action that stimulated the defense mechanisms and resulted in the life span extension. In 1997, Jang reported that topical resveratrol applications prevented skin cancer development in mice treated with a carcinogen. There have since been dozens of studies of the anti-cancer activity of resveratrol in animal models. No results of human clinical trials for cancer have been reported. However, clinical trials to investigate the effects on colon cancer and melanoma (skin cancer) are currently recruiting patients. In vitro resveratrol interacts with multiple molecular targets, and has positive effects on the cells of breast, skin, gastric, colon, esophageal, prostate, and pancreatic cancer, and leukemia. however, injected intraperitoneally, 2.5 or 10 mg/kg of resveratrol slowed the growth of metastatic Lewis lung carcinomas in mice. In several studies, small doses (0.02–8 mg/kg) of resveratrol, given prophylactically, reduced or prevented the development of intestinal and colon tumors in rats given different carcinogens. states that the dose was 400 mg/kg of body weight (much higher than the 22 mg/kg of the Sinclair study). For an 80 kg (176 lb) person, the 400 mg/kg of body weight amount used in Auwerx's mouse study would come to 32,000 mg/day. Compensating for the fact that humans have slower metabolic rates than mice would change the equivalent human dose to roughly 4571 mg/day. Again, there is no published evidence anywhere in the scientific literature of any clinical trial for efficacy in humans. There is limited human safety data (see above). Long-term safety has not been evaluated in humans.